21 v. : ; 24 cm. 2mg Office, Washington 25, D. C.
tables in town and city. Victor R. Boswell and Robert E. Wester. lant Industry, Soils, and Agricultural Engineering. [401 p., illus. merly issued as M 538. Price 20.
id cleaning grass and legume seed in the Western Gulf region. olf. Soil Conservation Service. 106 p., illus. (AH 24.) Price 650.
by Chicago bakers. Bureau of Agricultural Economics. 87 p.
by farmers in the North Central region. W. N. Starkey, 0. C.
L. F. Herrmann. Bureau of Agricultural Economics. 42 p., illus. of America north of Mexico-Synoptic catalog. C. F. W.
ig methods and costs. Robert E. Marx and James W. Birkhead. agricultural Economics. 122 p., illus. (C 868.) Price 304. 3are. Bureau of Entomology and Plant Quarantine. 32 p., illus. stry. 8 p., illus. (C 873.) Price 104. Eleanor W. Clay, Office of Information. e Superintendent of Documents, Government Printing Office, Washington 25, D. C.
ticile Act. Production and Marketing Administration. Pp. 13-38.
and sheep. Production and Marketing Administration. 4 p.
Service and regulatory announcements. Bureau of Animal Industry. Morton County, North Dakota. M. J. Edwards and J. K. Ableiter. North Dakota Agricultural Experiment Station. Series 1936, No. p., illus. (FCA C 133.) Price 154.
ministration. 37 p., illus. (FCA E 32.) Price 104. 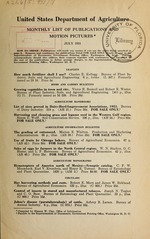 Report on the Agricultural Experiment Stations, 1950. R. W.
tion. Vol. 35, No. 7, July 1951.
agriculture. Vol. 15, No. 7, July 1951.
a year, domestic; $8.00 a year, foreign. 3ic; $1.50 a year, foreign. trol notes. Vol. 12, No. 3, July 1951.
agriculture. Vol. XV, No. 7, July 1951.
ig activities. Vol. 14, No. 5, June 1951.
lic; $2.25 a year, foreign. servation. Vol. XVI, No. 12, July 1951. Printing Office, Washington 25, D. C.
tones of Alaska, Hawaii, and Puerto Rico. SELECTION OF FRUITS AND VEGETABLES. Running time, 15 minutes. Released 1951.
also black and white. Running time 27 minutes. $120; black and white prints, approximately $35.